I went to the My Career Education & Entrepreneur Fair 2009 yesterday at Sabah Trade Centre, Likas. There were some booths with business-like aura and booths with trading aura~! I loved the trading booths as they sold food and drinks~! =) Up here is the Nutrition Club, it's a health drink made by professionals-doctors I think. And it's true, you'll lose weight, thin becomes normally balanced body weight, beautiful skin and you'll feel 10 years younger! I drink this too! 1 drink is RM10 for that day, if usual one, at Bukit Padang there (which opens in the early morning and late afternoon), is RM12 per each drink. You can buy the "milk" powders too, it's really tasty! There was a booth selling some soaps and perfumes and all too! Some the local delicacies like kuih cincin, kuih sapit, kuih lidah, kuih..err...don't know their names, but there were a lot of them! Here are the stuff I bought. A Version of Paris Hilton (yes, her perfume, a copy of it's scent) in 15ml for only RM17.60 (before was RM22). Well, 1st, I don't want to spend a fortune on perfumes, so sue me for I don't have enough money to buy a RM300 worth of perfume. =) I like the scent, though, it was the one that made me try all of the other perfumes, but alas it was it still. Next was an Ostrich Oil! Yeah, you heard me, OSTRICH! Burung Unta, y'know? It's used mainly for the body, like if you have muscle problems- muscle pain, muscle ache, muscle-anything la. Or if you feel cold, you just rub it on the area and you'll feel warm again (this baby is heaty! This was why I bought it really). It was sold for RM9! Saw the bottle and it was stated to be sold the same price- RM9 for both East and West Malaysia. Next up are these two darlings- YOU GOTTA TRY IT! It's soooooo delicious! It's the Coconut Jam! Yes, jam! Like peanut butter and jam that! Really, for real! Not kiddin ya! It has this UMMMPPPHH factor and my, would be great to be your bread spread or just a dip for any of your crackers in the morning, tea or anytime! It was on 3 for RM10! 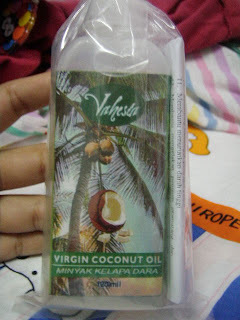 Here is a Virgin Coconut Oil! Made from the same booth (and here's why she's my no. 1 favourite now!). It was processed bio..something (told to be the best way to extract the oil, not by any other means) and it's good to be used both internally and on the outside. You can take it 3 times a day, 1 tablespoon each time. Anytime you want. You can use it for your hair, your skin, your teeth even, your legs, your nails, anything that needs moisturization, you put it! There are 100 benefits you can get from this natural source and moisturizing and healing are some of them. But i gotta tell ya, it tastes like...well, oil! But there was this santan smell, shows it's really 100% organic!